When the original Samsung Galaxy S II entered the scene five months ago, it blew its entire Android competition out of the water. The race wasn’t even close – the droid was not in a mood to take any prisoners. Interestingly enough, we are still to encounter a faster Android smartphone, made by a company other than Samsung, despite the significant number high-end dual-core offerings released by the competition since then. The Samsung Galaxy S II for AT&T is priced at $199.99 with a two-year contract. This is in line with all the current high-end offerings on the U.S. market. Let’s see now, what are the other possible options for the price range. Two days from today, the iPhone 5 will finally be officially released. In case you are not stuck with the Android ecosystem, it is an option worth considering. The amount of $99 can get you a 3D experience in the face of LG Thrill 4G. The droid is the U.S. version of the Optimus 3D. Its spec sheet is packed with features, but its OS is still Android 2.2 Froyo. Verizon Wireless has just launched the Motorola Bionic. The droid’s spec sheet is quite impressive, including the presence of LTE connectivity on board. We can’t say the same for its design and size. The Bionic is currently being offered at $299.99 with a contract. 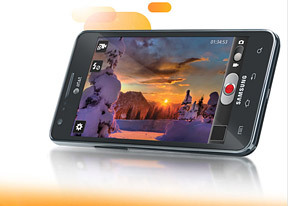 Sprint Wireless can offer you Motorola Photon, HTC EVO 3D and…Samsung Epic 4G Touch. All three droids are priced at $199.99, have WiMax present, and have feature-packed spec sheets. You probably already know that the Epic 4G Touch is the Galaxy S II version for Sprint. It has a bigger, 4.5” screen and a battery, packing the stunning 1800mAh. All this functionality is packed in a body slightly bigger than the Galaxy S II for AT&T has. If CDMA is your thing, look no further, we are sure Samsung won’t mind it if you pick it over the Galaxy S II for AT&T. T-Mobile has its own version of the Samsung Galaxy S II coming soon. It will offer you a bigger 4.5” screen, and a dual-core Snapdragon CPU, clocked at 1.5MHz. The droid will be able to reach network speeds of up to 42Mbps. The T-Mobile Galaxy S II will cost 229.99 when launched. This one is worth keeping an eye on. The HTC Amaze 4G will offer you similar spec sheet for a slightly higher price (we still can’t explain why). It will be launched simultaneously with the T-Mobile Galaxy S II for $269.99. And finally we have the HTC Sensation 4G and T-Mobile G2X as well. Keep an eye on the latter as it already received the Gingerbread update, and transformed itself into a serious droid. The U.S. version of the LG Optimus 2 costs $149.99 with a contract. The Sensation 4G on the other hand, will likely have its price dropped from the current $199.99, once the Amaze 4G is out. All the above options will not disappoint you. They won’t however offer you the Galaxy S II experience, save for, well, the other two Galaxy S II models, which we listed above. It’s been five months already since the first Galaxy S II came to the market and, we can attest, its AT&T sibling is a winner just like the original.